The USA Spec iPod Interface Cable connects, controls, charges, and plays an iPod through the factory stereo system of most Domestic, Japanese, and European vehicle brands. Get pure Digital Sound of your iPod into your factory radio. 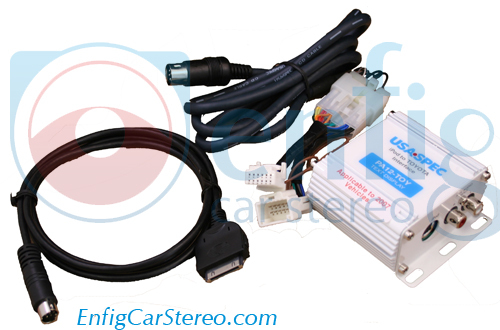 Also adds optional auxiliary input to connect any standard portable stereo device plus iPod connection. In some vehicles if Vehicle has existing external CD Changer it must be disconnected. Playlist Mode - Create up to 5 favorite mobile playlist then use the radio's CD changer controls to access and control your playlist. Direct Mode - Gives user complete control of their iPod while it is connected to the factory radio. iPod is not locked out while connected to the radio and user is able to manually access their complete iPod content. Radio still can adjust song up/down random or shuffle play but user can manually control their iPod and select any playlist, genre or Artist of their choice. Playlist mode or Direct mode must be selected at time of installation but can be changed by adjusting Pin Switches anytime. Connector behind radio. *If the vehicel has RSE, connect PA-11TOY @ ECU. *For CDP radio only. Connector at radio.